I always associate apples as a fall thing, but this year, I got a hold of some early apples from my sour cherry orchard hook-up. So, this late August & early September I was swimming in heritage apple varieties like Wealthy, Sunrise, and King apples, along with the more familiar Gala and Mac varities. I love apples so an early apple glut is a welcome surprise. I snacked on the crisp and juicy apples for as long as I could, but since I live in a shoebox of an apartment (no cold cellar), I couldn’t keep them crisp for long. So my delicious crunchy apples had transformed from an eating specimen to a cooking one – perfect for apple pancakes, ginger apple pandowdy, baked apple oatmeal, but I settled on trying out an apple cheddar quick bread instead. Good choice! The bread was delicious and flavourful and worked really well as a side for a vegetable stew I had made for supper. But we ate it toasted for breakfast the next morning and might I say it was even better. Toasted cheese and apple bits? I’m so in. The only real trick with this recipe was the baking time. I figured that 35-40 minutes should have been enough, but it wasn’t. While it looked lovely and golden on the outside, inside it was still gooey. So I baked it for an extra 15-20 minutes and it turned out fine. The recipe below reflects how long I think it should bake for, however, if you are using a larger loaf pan you might want to reduce the baking time. elsewhere: Want to see just about the prettiest thing? Click over to Poppytalk where I do a post with a recipe for sea salt caramels with toasted pecans. But that’s not all! I wrap up the caramels using parchment & washi tape so it makes a super cute gift. Adorbz. *if your loaf pan is larger, reduce the baking time by 10-15 minutes. Wow, this looks very intriguing and good! 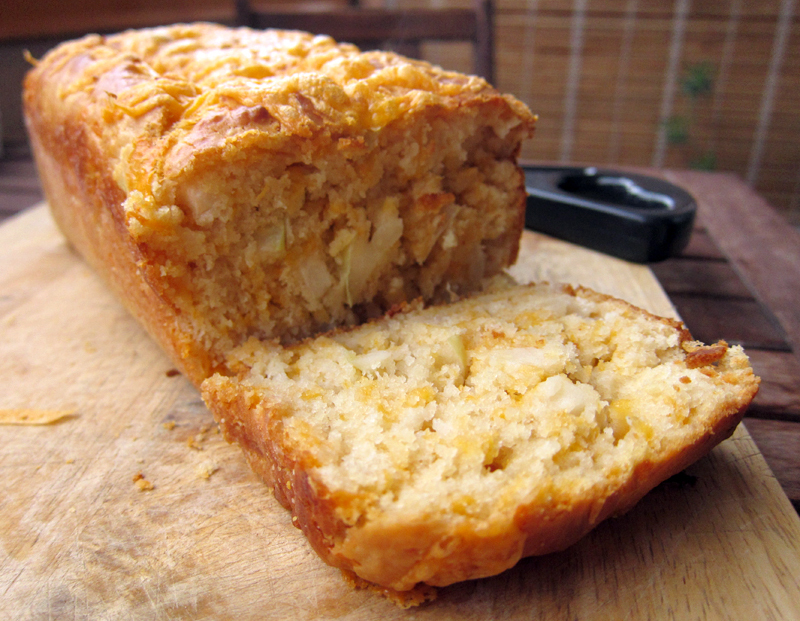 I’ve never thought to make a savory quick bread, and putting apples and cheddar together is genius. We just went apple picking and this will be a great use of our haul. In my opinion, there’s really no such thing as having TOO many apples. I’ve heard of the apple/cheese combo in a pie but I’ve never actually had it myself. This quickbread sounds delicious! This looks and sounds amazing. I’m going to have to try! I absolutely MUST try this bread. No ifs, ands, or buts! I have a box full of apples too! I’ve been getting through them slowly, but this weekend started making applesauce! I’m going to save a few and make this bread though! this looks great! One of my favorite snacks is apples and cheese, so I can imagine how tasty this would be. Thanks! This sounds amazing! I know what I will be bringing to a Halloween party this weekend. Lucky! I’d love to try those unique apple varieties. The bread looks wonderful and I can only imagine how a little toasting really made it perfect. I don’t like apples, and I don’t cook dairy in the house, and yet this looks divine. And I want it. do you think you could replace the oil with apple sauce? i know you can do that with cakes, and it’ll make it more appley and healthy perhaps? Looks incredible, Jeannette! I love the combination of sweet and savory and the bread looks so moist and tender, I really just want to toast a piece and slather it with butter! Absolutely delicious — especially for breakfast with some good peanut butter. Mine baked a little faster. It was more or less ready after 45 minutes — left it another 5 with the Cheddar sprinkled on top, and it was perfect. 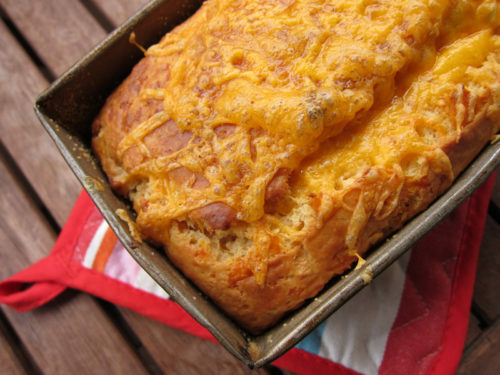 Apple and cheddar – that sounds like a combination made in heaven:)The bread looks gorgeous – wish I could grab a bite from your plate;)Lovely recipe! Made this the other day and it is wonderful. We found that you do need to toast it if you are eating the next day and it goes with so many different kinds of soups. Thanks for posting! Thanks for all your comments – it’s a tasty bread! Pam, so glad yours baked faster – Good to hear! The only problem is that it’s too good. Just had another slice – toasted, plain. I’ll be making this one often. I have to say, I’ve never understood the apple and cheddar pie thing, but in a bread? Sure! We picked some apples earlier this month and some are great for eating but others are not. I’m thinking I just need to throw the whole lot into some bread! I’ve been wanting to make savoury bread for a while but yeast still confuses me. This is a perfect way to make bread for those who have an aversion to yeast. And it looks delicious to boot! Currently trying this recipe as vegan. I will let everyone know the results! Thank you for sharing this. I have included this the Kosher Cooking Carnival I hosted this month. Love your site! Pam, hooray! So glad you love it! Dana, I’ve never tried apple pie with cheese either. Seems odd, sorta. But this, THIS, is amazing. Bijoux, don’t be afraid of this – no yeast! Hooray! Good luck. I hope you enjoy this, Rose-Anne! Marisa, I want to hear how it turns out. I’m sure using Daiya cheese would be a good sub. I found this on Pinterest earlier this week and today I made it. How’s that for turnaround? Anywho-Loved it. Love your blog. I am trying out at least one new recipe a week and posting about it on my blog. This one will go up on Thursday, with a link to your site. There is plenty of yummy goodness for me to try out! Thanks so much Casey – glad you loved this and can’t wait to see your post! Made it yesterday night and two-thirds of it are already consumed. Yum! Wow! This bread looks amazing! I can’t wait to try it out over the weekend. Oh my this looks seriously outstanding. I must make it! This is my kind of quick bread. Glad to hear it, Bijoux!! Carlee, I hope you give it a go! Ashley, it’s super delicious, I hope you love it. I made this one! 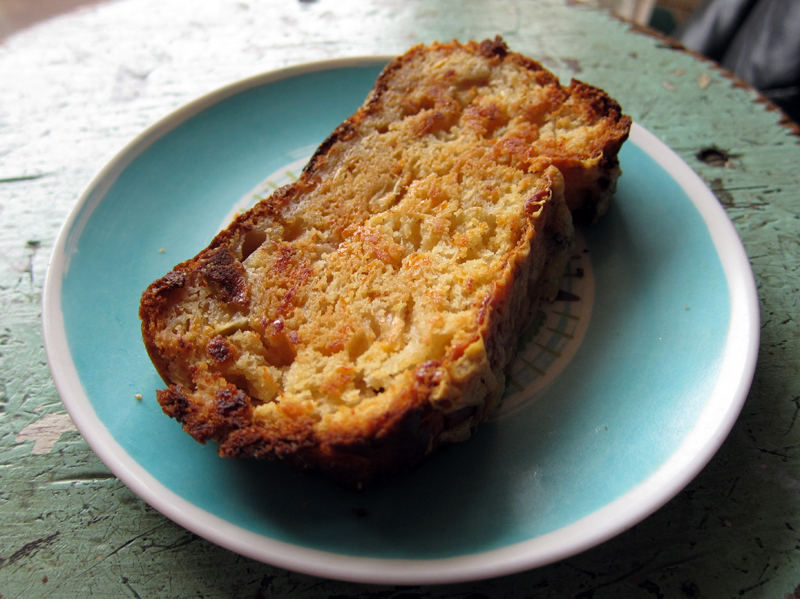 It was good – a little moist in the middle and crunchy on the outside (I assume because of the apples). I wish I had used more flavorful apples – but it was still a hit! Made this bread yesterday! It’s not exactly savory; the apples do give a fair amount of sweetness. But the resident fellow and I really liked it. Thanks for a good little long-weekend project! Also! I’d recommend orange cheddar like you used if photos will be involved. I used a white cheese and bread looks a little fugly. Obvi, taste-wise it doesn’t matter! Haha, good to know, Maggie about the colour! Is that three quarters of a cup of milk *plus* two tablespoons of milk? Or does the 2 T refer to something else? Yes Ide, it’s 3/4 cup of milk + 2 tablespoons of milk, so just shy of 1 full cup. Hey! So I’m thinking about trying this recipe tonight but my family is not a fan of apples ( except in pie and plain) and so I was wondering if I could do this recipe EXACTLY the same way and just omit the apples? Would it be okay, do ya think? Carlee, how could they not love apples – seriously, I think they *could* like this! 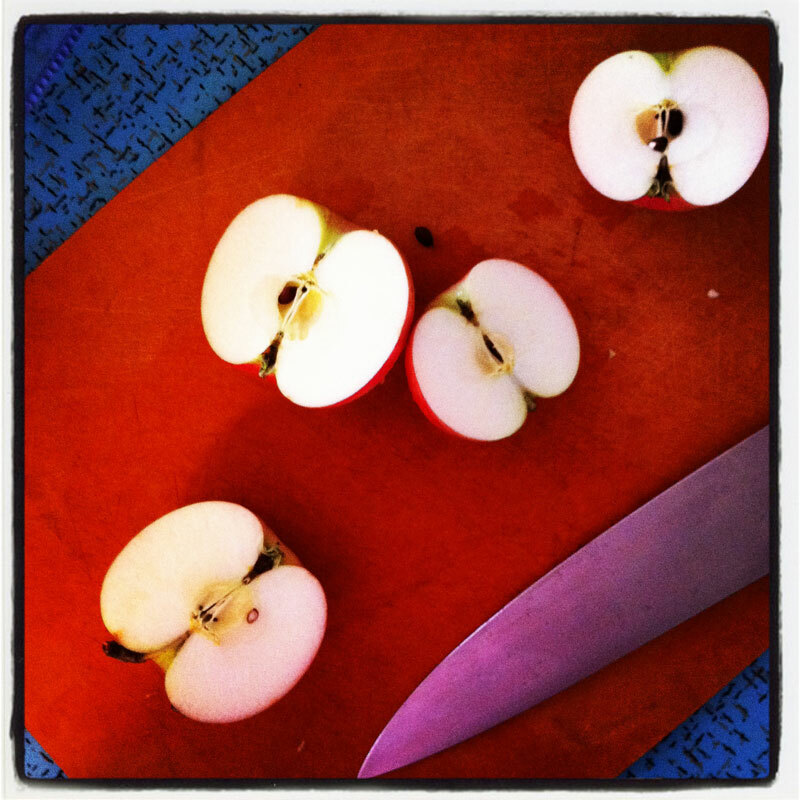 You could grate the apples instead of dicing that way you’d be sneaking in a little surprise. Or you could do without….if so, let me know how it goes! This was a great recipe, thanks! Oh my goodness! I just made this in muffin form it’s sooooooo good. I did sub a sharp white cheddar and I small diced it too, instead of shredding. If any one is trying to do muffins: bake at the 400* as stated for 18-20 min. oh , and I didn’t melt the cheese on top but they were still amazing! Okay, I just made this, and IT IS AWESOME. We are loving this bread! Thanks!! I ADORE your blog!! Especially since it is Canadian — great Canadian cooks don’t get the recognition they deserve and it’s wonderful to see you using local ingredients and items familiar to Canadians. Has anyone made this ahead and froze it? how does it turn out once thawed? Jill, I think it would be fine frozen. If you try it let me know how it goes.